The field of computer hardware engineering is diverse. Hardware engineers can manufacture, test, design or even install a variety of computer hardware devices. Computer hardware engineers are highly paid, educated professionals that have a variety of options for advancement. A computer hardware engineer may design, develop, research, test or simply install a variety of computer equipment. Some computer hardware engineers troubleshoot existing equipment while others develop micro circuitry and other complex components. The median pay for a computer hardware engineer is $98,810 a year according to the Bureau of Labor Statistics. Though this field has slower growth than is average, the job still offers many opportunities for advancement and for expansion into different fields. Computer hardware engineers will need to be driven, detail-oriented and knowledgeable. The field is extremely broad, which means an engineer can find an industry and area of expertise that they enjoy. Engineers can work on routers, circuitry, graphics cards, processors and more. Engineers may also be called upon to troubleshoot the workings of a computer system in the event that hardware, not software, is the issue. The field of computer hardware engineering is extremely broad, which means a computer engineer could do a variety of things. Entry-level computer engineers may be called upon for troubleshooting work or to fix existing hardware components. Computer engineers with advanced degrees may begin designing or constructing micro circuitry and other forms of computer hardware. Overall, a computer hardware engineer will work in advancing the industry of computer hardware and supporting current hardware technology. Computer hardware engineers may work in laboratories or development and manufacturing studios, or they may work with firms that specialize in the development or maintenance of hardware components. Most hardware engineers will work in large teams and will need to be able to collaborate effectively and take direction well. Hardware engineers will need to be able to read complex blueprints and may need to be skilled in machining and other development techniques. How Do You Become a Computer Hardware Engineer? Unlike many other computer science and IT fields, most computer hardware engineers are required to have at least a Bachelor’s Degree or a Computer Science degree. Entry-level positions in the field will usually have on-the-job training regarding the mechanics and the tools used, but a degree offers the basis for this training. 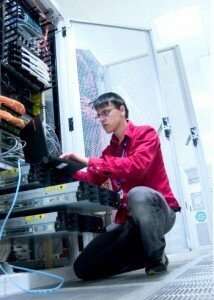 Computer hardware engineers that do not have a degree will usually need to have significant amounts of experience and relevant certifications, and they will often need to begin at a junior level. Computer hardware engineers will need to learn about the software systems used to develop components and will often need to work under someone until they are able to engineer hardware on their own. Many computer hardware engineers will find work in development firms, design firms or for the government or military. How Do You Advance as a Computer Hardware Engineer? A computer hardware engineer will usually advance in the ranks by moving on to more prestigious firms or by being put in charge of certain products. Computer engineers can move into related fields such as computer systems analysts or computer systems architects, but computer engineering is usually the most highly paid field of this group. Computer systems engineers are one of the most similar fields to computer hardware engineering, but the median pay for this field is $81,140 according to O*Net Online. Those that are extremely talented at computer hardware engineering may eventually be able to head their own development teams and manage their own staff.